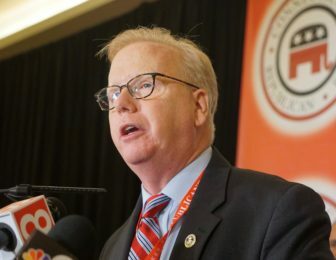 Republican gubernatorial contender Mark Boughton upped the ante Monday in his plan to phase out the state income tax, pledging more than $380 million in taxpayer relief in his first two-year budget. The Danbury mayor outlined the tax cut as part of a 10-point revitalization plan that also includes other tax reductions, reorganizing the governing board for public colleges and universities, and scrapping a planned widening of Interstate 95. Boughton, who’s been pledging for months to phase out the income tax over 10 years, now says that will start right away — even though his proposed relief would significantly worsen an already daunting $4.6 billion-plus deficit in the first biennial budget after the election. The first “choice” Boughton outlined would be to begin his planned phase-out of the state income tax in the first two fiscal years of the next term with reductions to most tax rates. Connecticut currently utilizes seven different rates — ranging from 3 to 6.99 percent — to tax household income. For example, an individual earning $150,000 per year would be taxed at 3 percent on the first $20,000, at 5 percent on the next $80,000, and at 5.5 percent on the final $50,000. The wealthiest households pay 6.99 percent on all of their income. Boughton’s plan would lower all rates by a quarter of a percentage point or less, except for one — the 5 percent rate that plays a major role in determining the overall tax liability for middle-income individuals and couples. His plan does not state, though, how he would accomplish this goal in the face of the huge post-election deficits projected by nonpartisan analysts. State finances, unless adjusted, are on pace to run $2 billion in deficit in first fiscal year of the new term, and just under $2.6 billion in the red in the second. Those deficits represent 10 and 13 percent, respectively of all General Fund spending. Boughton says his tax cuts would provide $381 million in relief in his first biennial budget, which would increase the projected two-year shortfall by roughly 1/10th. Further compounding matters, the next governor would be legally barred from imposing large-scale layoffs for the first two fiscal years to help balance state finances. That restriction was imposed by a union concessions plan negotiated by Malloy and ratified by labor and the legislature in 2017. That also means the next governor would have no legal leverage to seek further concessions from public-sector workers during the first half of the next term. When Malloy won re-election four years ago, he faced projected deficits of just under $1.4 billion and $1.6 billion in the first two years after the election. He and the legislature increased income taxes by $170 million per year by raising rates on wealthy households and by reducing tax credits for middle-income and poor families. Malloy and the 2011 General Assembly created the Board of Regents for Higher Education — an oversight panel with members appointed by the governor and the legislature — as a compromise to oversee a merger system of community colleges, state universities and the online Charter Oak State College. Malloy had proposed a system directly overseen by the Executive Branch. By the end of 2012, the system nonetheless was rocked by controversy. Robert A. Kennedy, who was recruited by Malloy to lead the new system as president, resigned amid disclosures he unilaterally approved 21 executive pay raises without board approval. Those increases, which totaled almost $300,000, came while most state employees were in the second year of a two-year wage freeze. The largest of those increases, nearly $50,000, went to another administrator recruited by Malloy, Executive Vice President Michael P. Meotti, whose salary rose from $183,339 to $232,244. Meotti would relinquish the raise and resign later in 2012. That problem was compounded by the disclosure that Kennedy was absent from the central office for six weeks during the summer of 2012, using a clause in his contract that he said was allowed for purposes of “professional development” to work remotely from a second home in Minnesota. Boughton, who opposes establishing electronic tolls on Connecticut’s highways, said the transportation infrastructure program must be reconfigured, and massive projects, such as the widening of I-95 from Greenwich to Stonington, must be scrapped. Boughton argued widening the highway would lead to worse congestion. But the Department of Transportation announced last February that it could implement a “strategic and incremental” widening that would ease gridlock, and could do so without having to take huge swaths of expensive private property in Fairfield County by eminent domain. But Malloy said the plan, which would cost more than $4 billion and take at least eight years to widen various sections of the highway has no chance of proceeding until legislators stabilize Connecticut’s cash-starved Special Transportation Fund with a major infusion of revenue. Malloy also warned earlier this year that many other major projects, including replacing the elevated section of I-84 in Hartford and repairing the “Mixmaster” junction of I-84 and Route 8 in Waterbury likely would not proceed in the coming years without new revenue. Increasing the maximum time repeat or violent offenders must serve before being eligible for parole from 85 percent of a sentence to 95 percent. Barring parole for those convicted or first-degree sexual assault, first-degree assault using a deadly weapon, first-degree assault on an elderly, blind or disabled person, first-degree assault on a pregnant woman resulting in the loss of the unborn. Eliminating the business entity tax and reducing fees and regulations on businesses. Transferring more intellectually disabled patients from state-run facilities to community-based programs run by private, nonprofit entities. More job training for veterans and funding for regional fire schools.